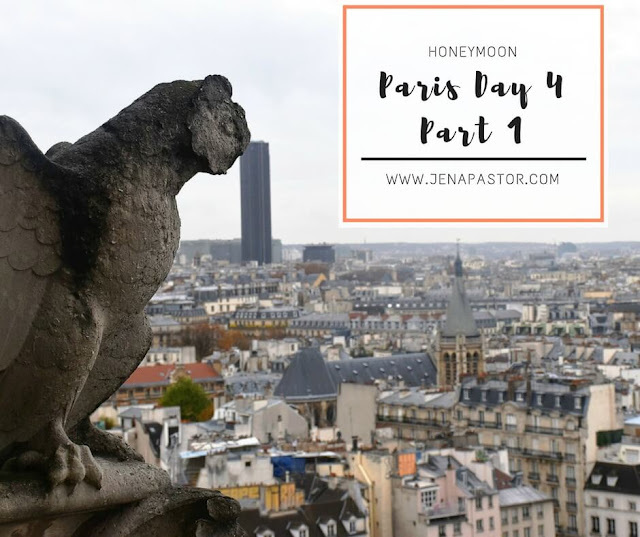 It was a jam-packed day for me and my husband on our fourth day in Paris. 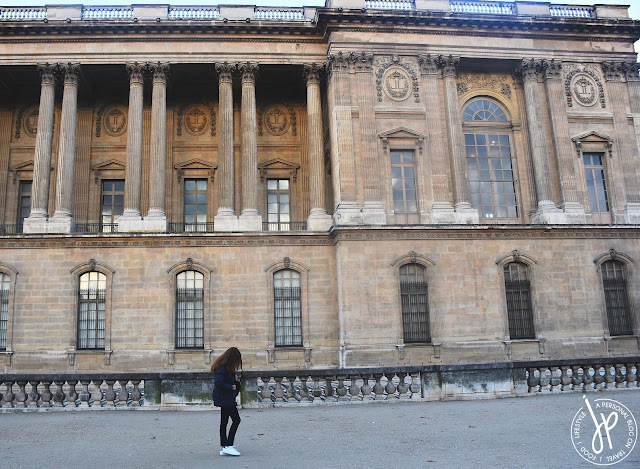 The weather was favorable and a bit sunny, so it was a great day to go out and enjoy the city. 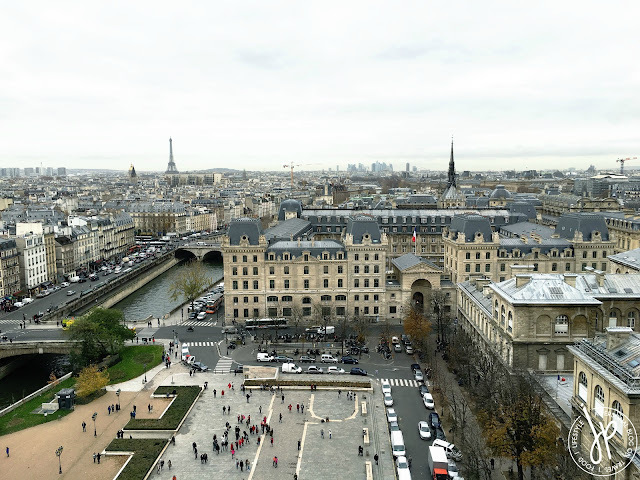 After grabbing our usual breakfast of viennoiseries, coffee, and hot chocolate at Rivoli Cafe in Rue de Rivoli, we walked towards Pont des Arts and sat on one of the benches to enjoy our scenic breakfast view. 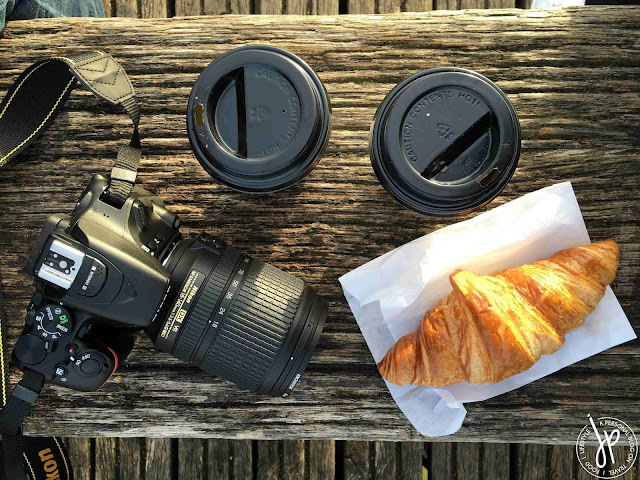 We loved our simple yet charming breakfast as the sun was gleaming over the Seine and as we watched people cross the bridge, debating whether they’re locals or tourists like us. 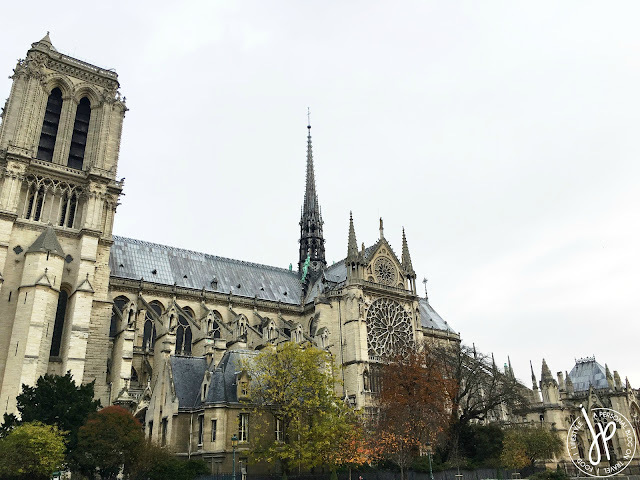 After finishing my last bite of croissant, my husband and I rode the Big Bus hop-on, hop-off bus to Notre-Dame Cathedral. I’ve been here before so I became my husband’s personal tour guide. 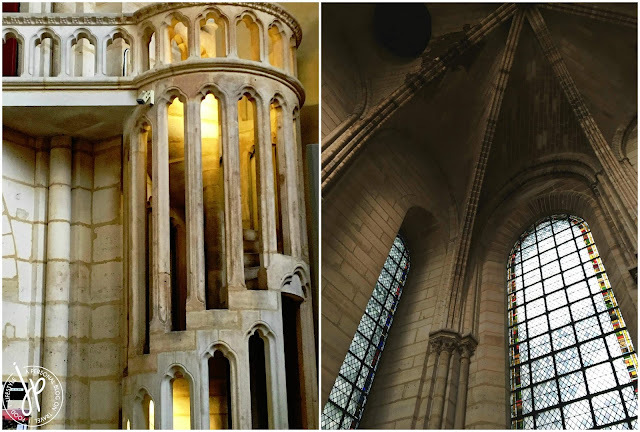 I only went inside the cathedral (free entrance) during my first visit, but I wanted to climb the towers this time. 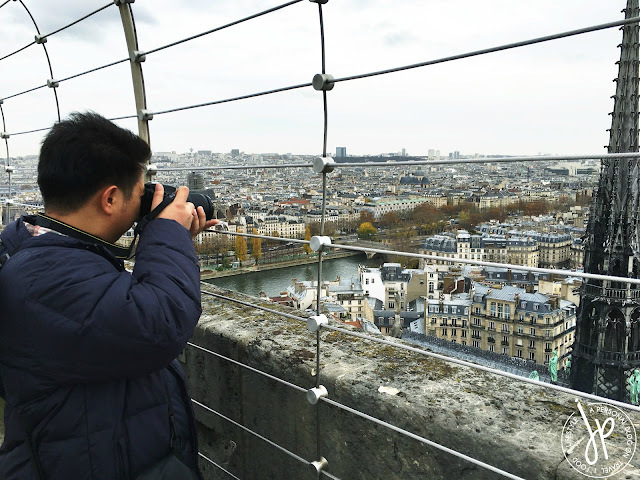 Since the weather was good, I believed getting on the rooftop of Notre-Dame was the perfect opportunity to witness a spectacular view of Paris from one point in the city. 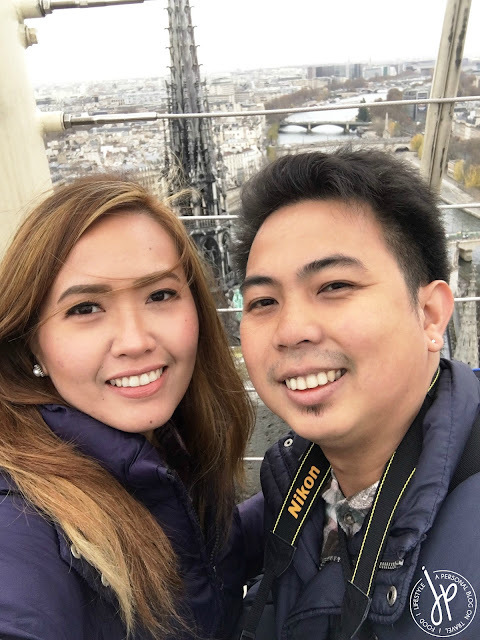 Feeling like a first-time tourist, we marvelled outside the beauty of this medieval Catholic cathedral, one of the best types of French Gothic architecture in the world and the most glorious one. 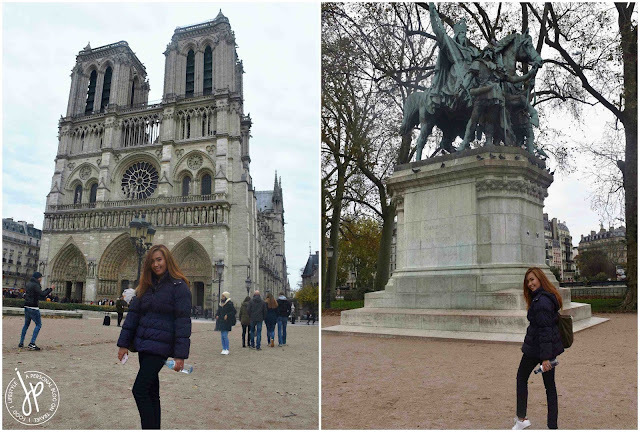 Construction started in 1163 and eight centuries after, this magnificent structure still stands. 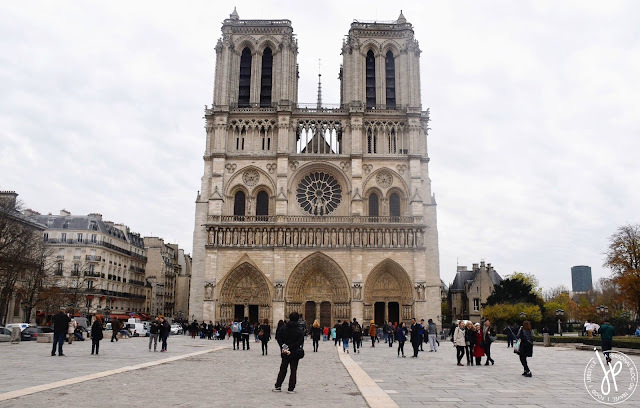 Notre-Dame is located at Paris’ 4th arrondissement on the Île de la Cité, one of the remaining islands in the Seine and the center of Paris (marked with kilometre zero on the ground). 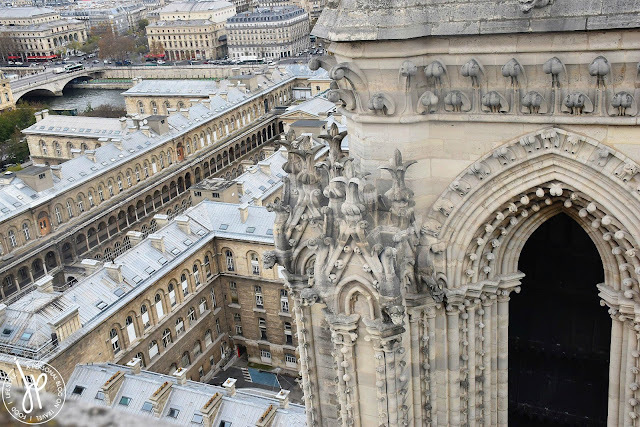 Incredible architecture of Notre-Dame Cathedral that spans 200 years in the making. 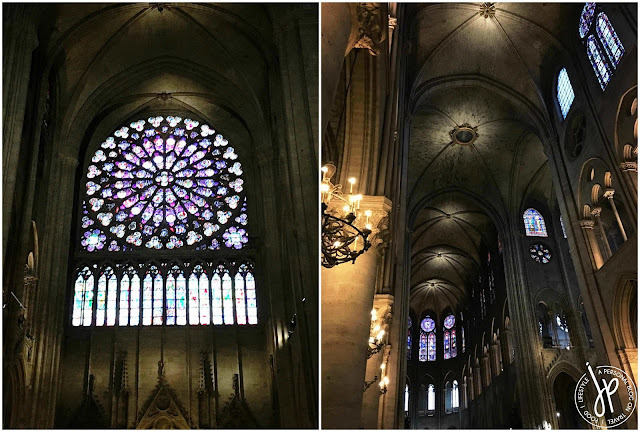 The flying buttresses as seen on the left side of the stained glass window are half-arches that support the thin, high walls and glass windows of Notre-Dame against its stone roofs. 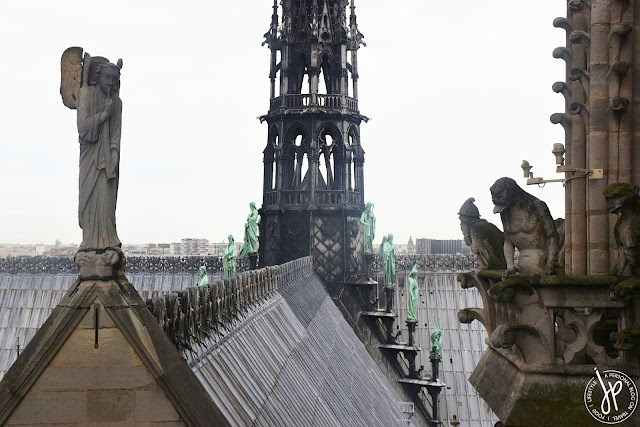 These flying buttresses were popular in Gothic architecture. 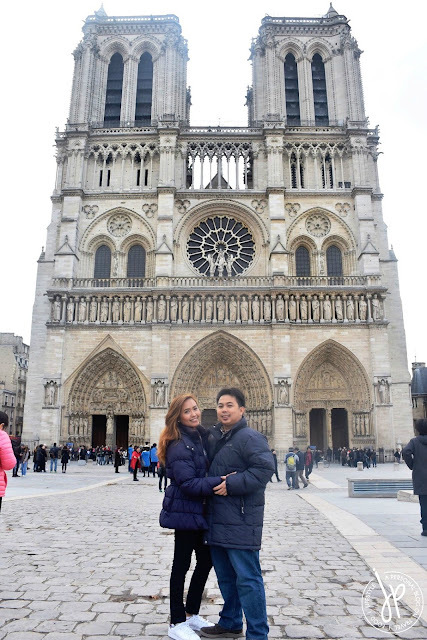 We spent about 20 minutes inside the cathedral before proceeding to the line going up the tower. A ticket costs €10 and only a group of 20 people were allowed to enter the doors at a time. 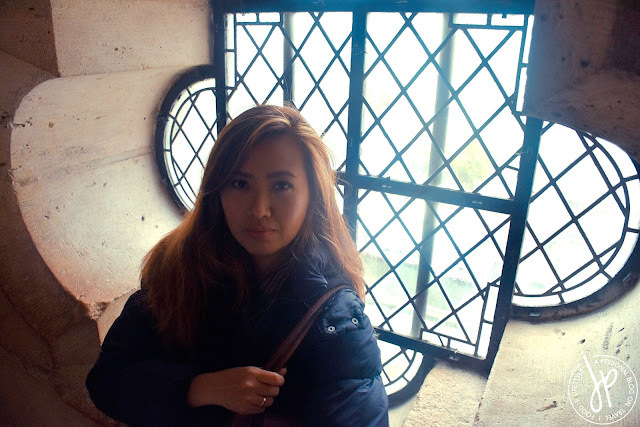 Since we came in early (and during off-peak season, too), we only waited around 15 minutes to get inside the tower. 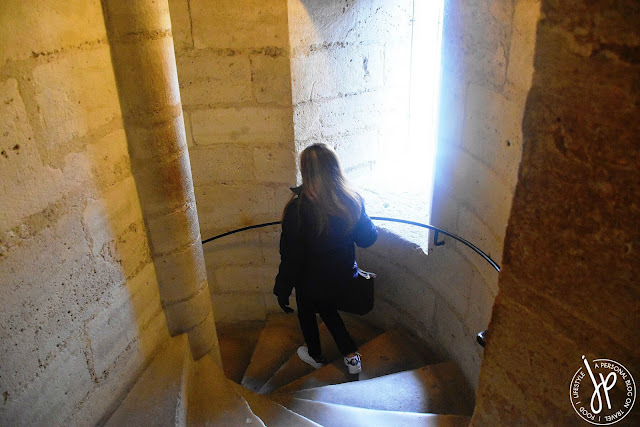 I got to be honest – the actual climb was a struggle for me, not because of the number of steps (387 in total), but because I felt claustrophobic ascending the spiral staircase. 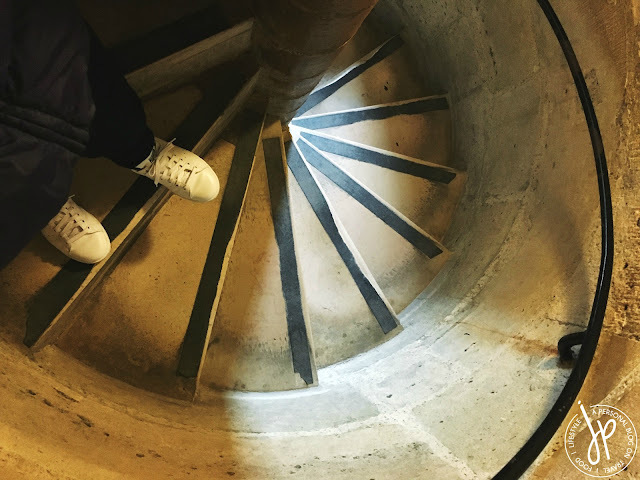 The reason why only a few people were allowed to enter at a time was because the space in the staircase was too narrow and there were only a few windows available. Landing spaces to catch your breath were non-existent (only tiny spaces near a few windows). Nevertheless, the view on the top was more spectacular than I ever imagined. Me telling my husband to distract me while I try my very best not to freak out. 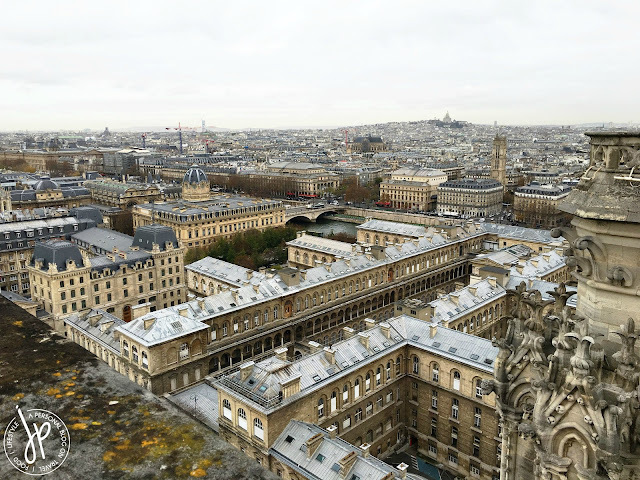 From the rooftop, we could see the expanse of central Paris, the River Seine, the Eiffel Tower, tourists gathering below, Île de la Cité’s perimeter, the old Parisian apartment rooftops, and the cathedral’s first arrow, which was a bell tower in the 17th century. 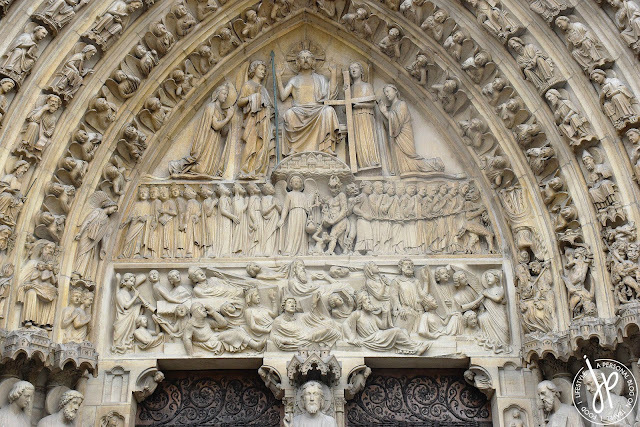 Statues of the twelve apostles can also be seen from the arrow. 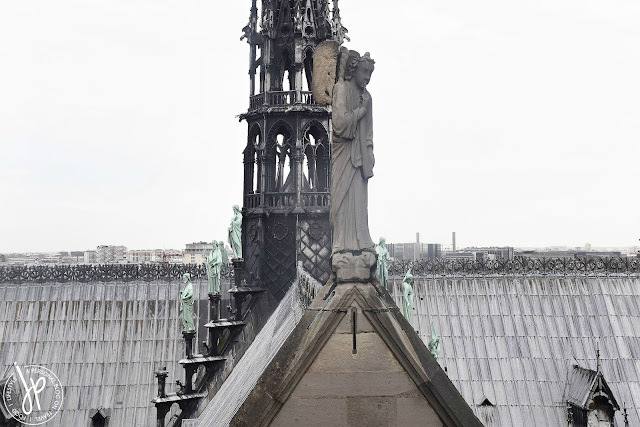 The Arrow or Spire of Notre Dame Cathedral, which served as a bell tower during the 17th century. The seafoam green statues represent the 12 Apostles. 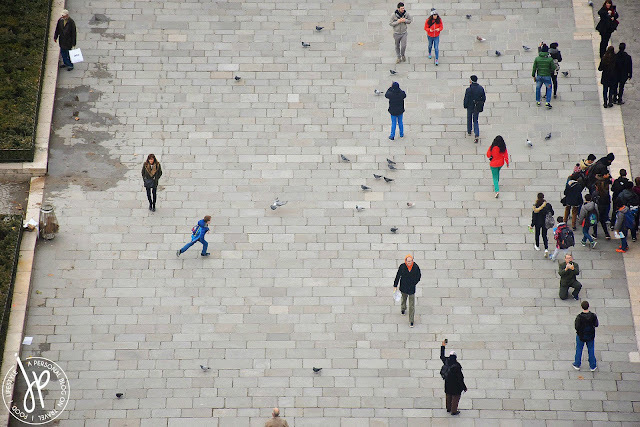 Tourists converging at one point in Parvis Notre-Dame, most probably at Point Zero. 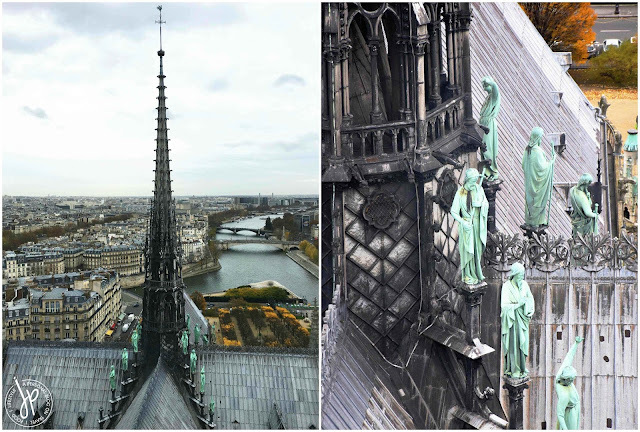 In my opinion, the best structures in Notre-Dame’s rooftop were gargoyles and chimeras. 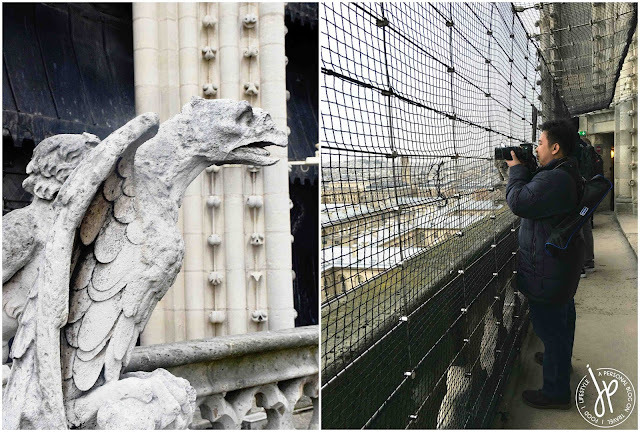 It’s interesting to find some chilling beasts and half creatures on a Catholic cathedral, but these are actually made for practical use to keep Notre-Dame away from water damage. 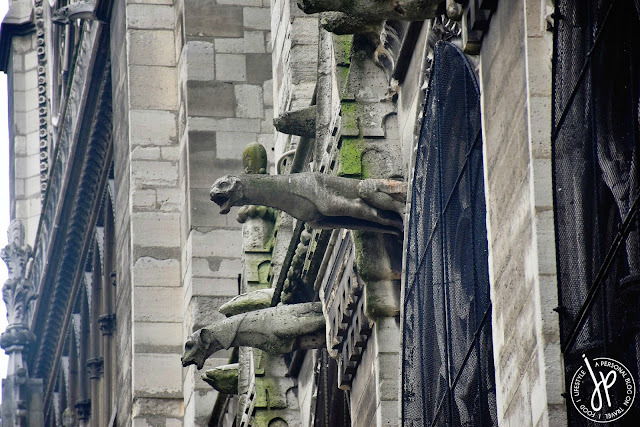 These gargoyles have spouts or passageways that collect rainwater from the roof, out of their mouth, and out of the cathedral. Not only are they useful, but they also add story and artistic touch on snapped photos. 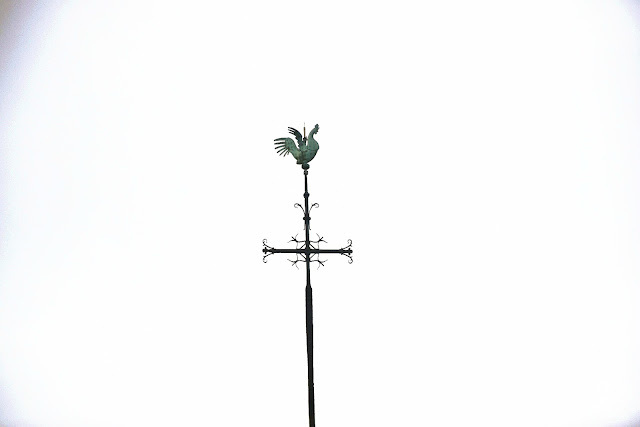 Left: A chimera on the tower's railings. Right: Husband taking snaps at the first floor viewing platform. 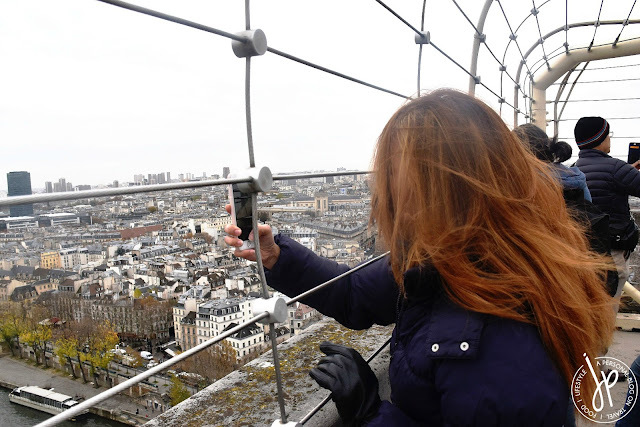 Husband taking photos of Paris at the second and highest viewing platform. Me, trying my best to take photos and not to drop my phone at the same time! 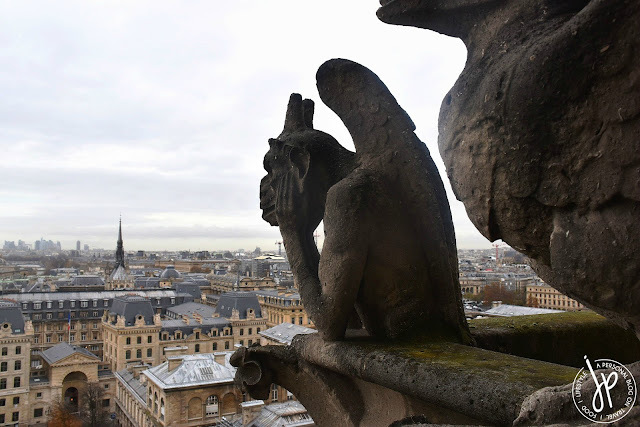 While the gargoyles seem to be guarding the roofs and corners of Notre Dame, Catholic churches depict them as evil monsters kept outside the church. In other aspects (such as Disney’s Hunchback of Notre Dame), the gargoyles (grotesques may be the right term here) are annoying, yet funny characters who are friends with Quasimodo. 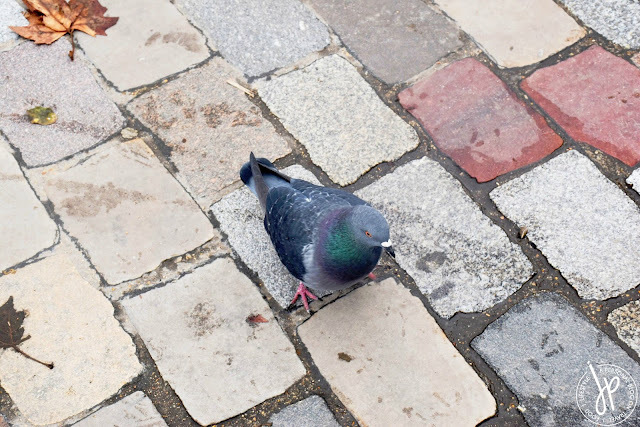 They are monsters made adorable who defend the cathedral from evil spirits. We only stayed about 15-20 minutes at the rooftop, for another group of tourists were expected to reach the viewing deck. Descending the tower was pretty quick and I was grateful for being out of the staircase in just a short time. Finally, a quick descend out of the tower! Look how small the space is. Thankful for occasional windows. I survived 387 steps! Now it's time for snaps! 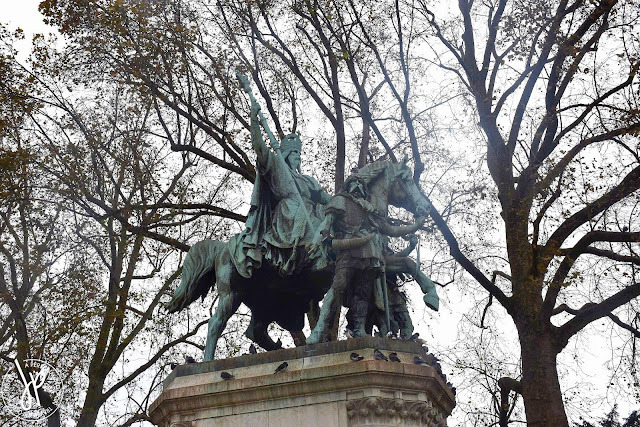 Charlemagne et ses Leudes (Charlemagne and his Leudes) Monument outside of Notre-Dame. Charlemagne or Charles the Great united most of Europe during the early Middle Ages, thus gaining the name Father of Europe. 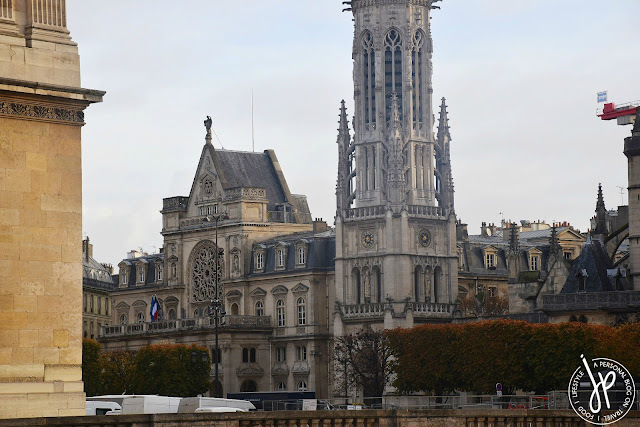 We stayed outside the cathedral for a bit to take photos and listen to the bells ring at around 11:49 AM, Paris time. When the tourists started to thin out, my husband and I walked towards the famous Point Zero, the official center of the city. 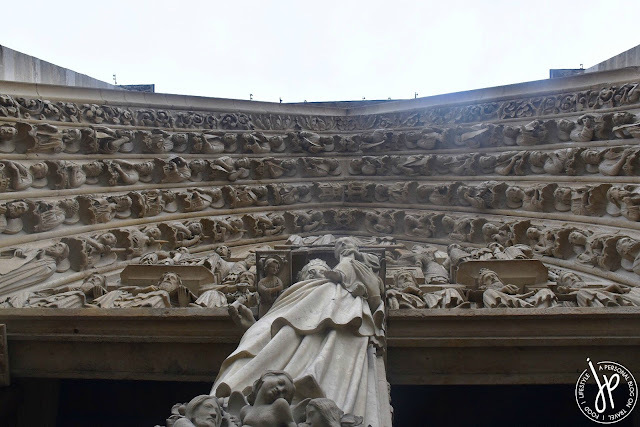 Left: Rue du Cloître-Notre-Dame where people line up to get inside Notre-Dame's tower. 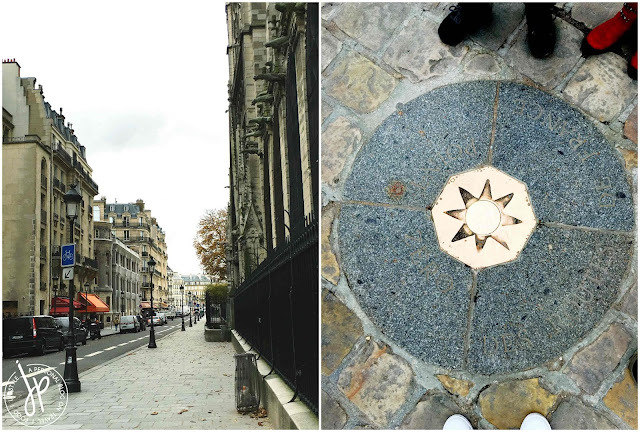 Right: Point Zero, a bronze plaque on the cobblestone in front of Notre-Dame Cathedral's main entrance. 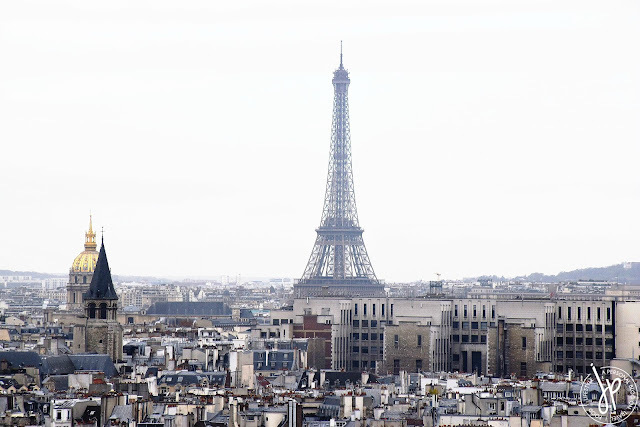 Point Zero or Kilomtre Zero is a geometric marker that measures distances from Paris' center to other places. We stepped on it and made a wish. 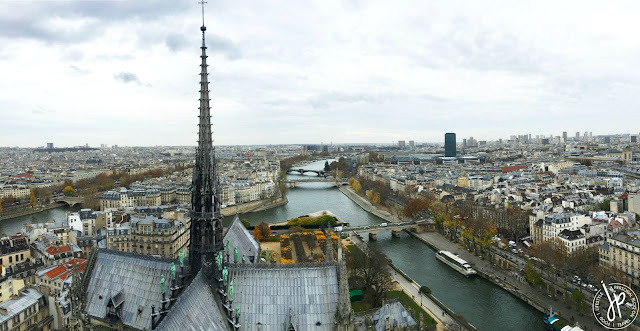 Walking out of Île de la Cité towards 5th arrondissement to find lunch, we found ourselves nearing Shakespeare and Company, an independent English-language bookstore in Rue de la Bûcherie at La Rive Gauche (The Left Bank) and just 200 meters away from Notre-Dame Cathedral. 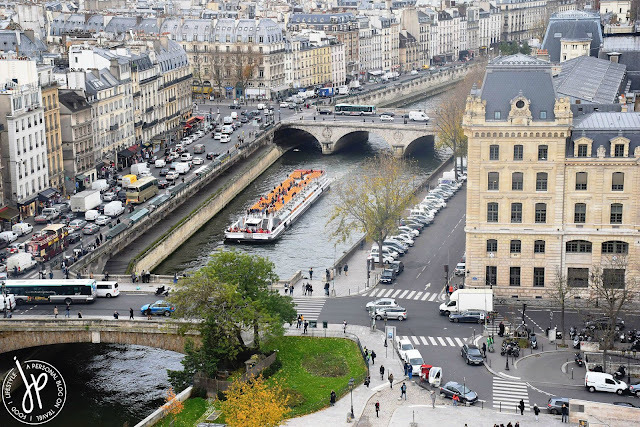 Majority of Paris’ bookstores and souvenir shops along the Seine sell books in French, that’s why this particular one is popular among tourists. It’s not allowed to take photos inside Shakespeare and Company, but it’s worth a visit! For booklovers and (and those who love to be surrounded by books), it’s easy to get lost inside shelves and walls of familiar books in a multitude of covers (which are different from covers sent in my country), prints, and editions. Outside Shakespeare and Company. Discounted books were being sold outside. Inside Shakespeare and Company isn’t your typical bookstore, but looks more of a huge, personal library inside a warm and cozy house. The place felt very welcoming and had lots of wooden pieces and furniture like stools, ladders, and signage (which reminds me of The Burrow, home of the Weasleys). I picked up a copy of A Moveable Feast (stamped at the cashier) and an eco bag as a souvenir. I would’ve bought more books if it weren’t for the 23 kg limit on the plane going to Croatia. Left: My hangry husband and our Asian lunch. 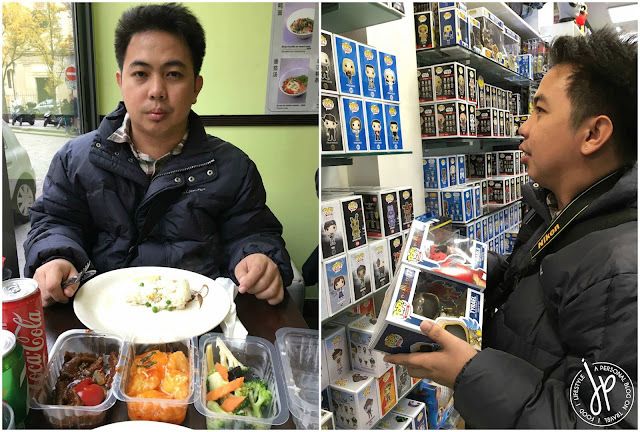 Right: My happy husband after eating rice now checks which Funko Pop toy he's going to get. 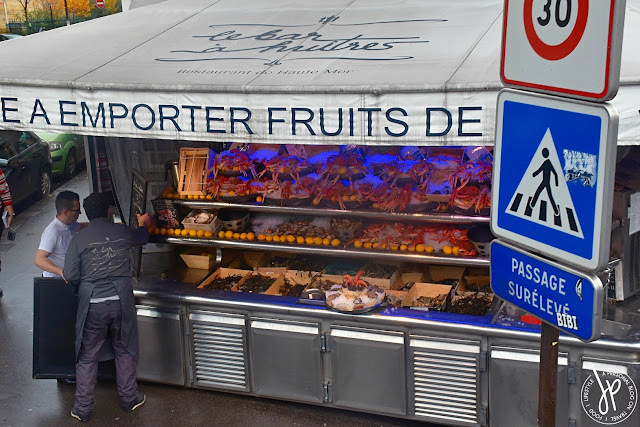 I knew my husband was already hungry by the time I made my purchase, so we walked along Rue du Petit Pont to find a good place to eat. I had this urge to eat rice and so I was delighted to find Ladelice Sushi at the corner of Rue Saint-Jacques and Rue Galande. 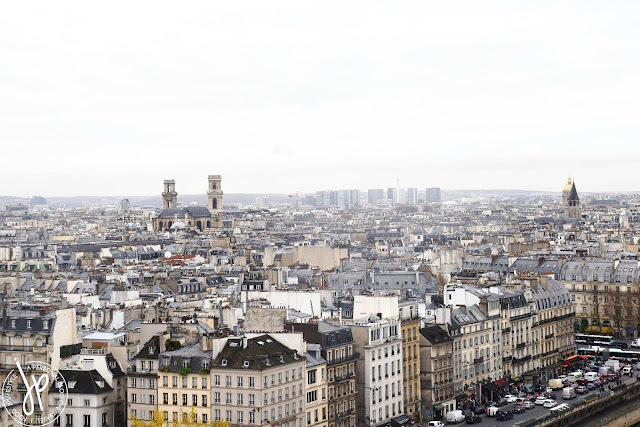 It’s only less than 100 meters from the bookstore (street behind Rue de la Bûcherie). The name was a little misleading, for sushi places usually serve, well majority sushis of course. This restaurant, however, serves Chinese food for the most part. They do have bento meals with limited sushi selections, but what I liked about their set-up is that you can order food by weight (usually starting at 100 grams). A meal in Paris (such as one serving of pizza or pasta) has an average cost of €10 (good for one person only), but we only paid a total of €12 for both our food. After satisfying our rice cravings, we walked around the block to check out what else we can find at 5th arrondissement. Since my husband patiently waited for me at Shakespeare and Company, I accompanied him inside Pulp’s Toys along Rue Dante as he purchased two Funko Pop figures. 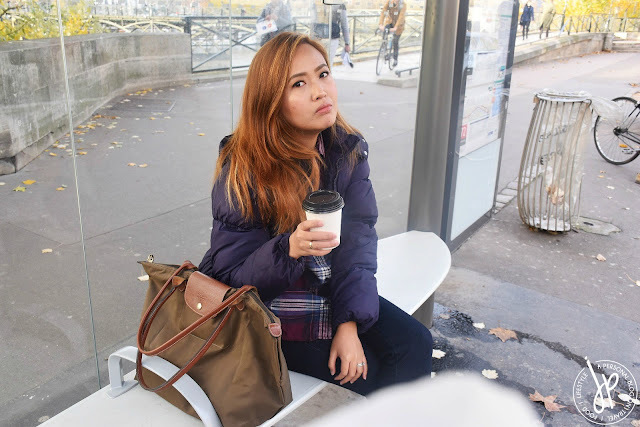 We headed back to the bus stop after and hopped on a Big Bus going to Trocadéro, intending to take many snaps of us in this beautiful City of Light.